Sixteen elementary types of particles form the basis for the theoretical framework known as the Standard Model of fundamental particles and forces. J.J. Thomson discovered the electron in 1897, while scientists at Fermilab saw the first direct interaction of a tau neutrino with matter less than 10 years ago. * Scientists suspected for several hundred years that light consists of particles. Many experiments and theoretical explanations have led to the discovery of the photon, which explains both wave and particle properties of light. This graphic names the 16 particle types and shows when and where they were discovered. These particles also exist in the form of antimatter particles, with the same mass and the opposite electric charge. Together, they account for about 300 subatomic particles observed in experiments so far. The Standard Model also predicts the Higgs boson, which still eludes experimental detection. Experiments at Fermilab and CERN could see the first signals for this particle in the next couple of years. Other fundamental particles must exist, too. The Standard Model does not account for dark matter, which appears to make up 83 percent of all matter in the universe. The 1950s saw a proliferation of particle discoveries, thanks to the advent of accelerator-based experiments. By 1960, more than 100 particles were known and physicists began to find patterns. Slowly the Standard Model emerged. It has brought order to the particle zoo and explains a steadily increasing number of subatomic phenomena. 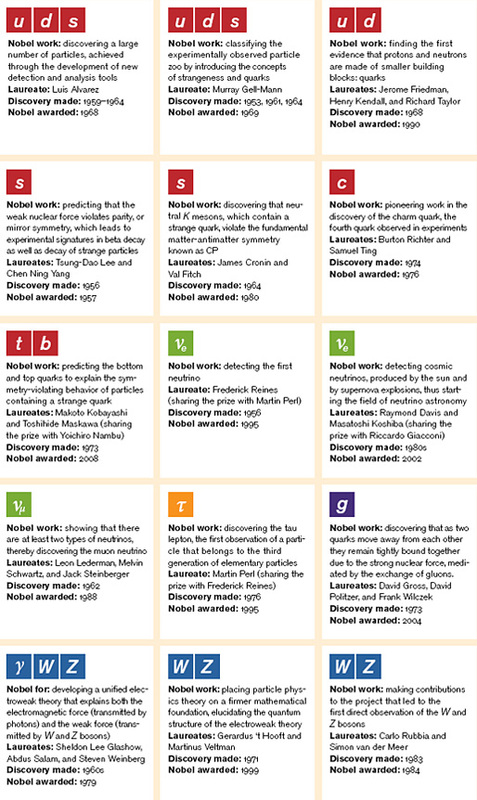 Here is a brief summary of 15 Nobel Prize-winning discoveries closely connected to the development of the Standard Model, beginning with the "particle explosion" in the 1950s. For more information, visit nobelprize.org.